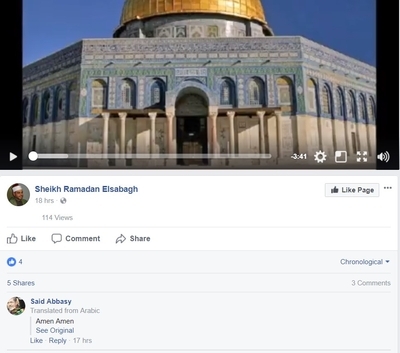 IPT Exclusive: U.S.-Based Imam Prays That "Allah Destroy the Zionists"
A Texas-based imam called for Israel's destruction in a recorded prayer posted to his Facebook page Thursday. While Sheikh Ramadan Elsabagh does not mention President Trump's proclamation Wednesday recognizing Jerusalem as Israel's capital, and starting the process of moving the U.S. embassy there, it seems to be a clear reaction. The Investigative Project on Terrorism translated Elsabagh's Arabic chanting. "Our Lord. Help holy Palestine," Elsabagh said. "... Oh Allah, be with your oppressed worshippers in Palestine, Oh Allah destroy the Zionists and their allies, and those who assist them, and those who allowed them into the abodes of the Muslims. By Your Power, Oh mighty one, Oh Mighty one, through Your Power and Might, Oh Allah deflect them with what You will, and however You will, for You are omnipotent, and with a response omnipotent." "Oh Allah save [Al Aqsa] from the hands of the accursed violators, whom you have cursed in every Book, and cursed them through every prophet," he said in conclusion. "Oh Allah destroy them." 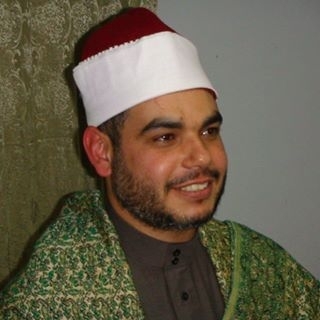 Elsabagh is listed as the head of the ISF Islamic Institute in Garland, Texas and is featured as a Quran reader on many internet sites. The video drew several comments of "amen, amen," according to a Facebook translation. One came from Said Abbasy, a New York-based Muslim Brotherhood supporter. Abbasy mourned the death of "Blind Sheikh" Omar Abdul Rahman – considered the spiritual guide for the 1993 World Trade Center bombers who was convicted for a plot to attack other New York landmarks and assassinate high-profile targets. "Oh God," Abbasy wrote on Facebook, "take vengeance on those who wronged him."